WordPress prides itself on being one of the simplest, most user-friendly blogging platforms available to businesses today. Within minutes of registering an account, you can say "hello, world!" and start promoting your products or services to an audience of potentially millions. But if you want to make the most out of WordPress's extensive features, you'll need to dig a bit deeper. 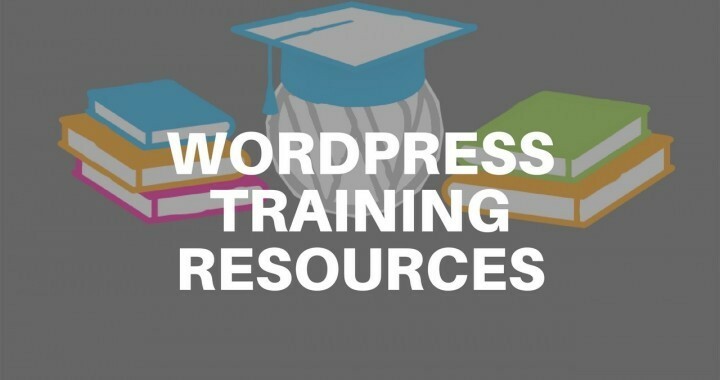 There are many WordPress training courses available online, both free and paid; here are just a few that we think are important. Not sure where to start? Easy WP Guide is your instruction manual for everything you need to know about WordPress, but didn't even know how to ask. It guides you through setting up your site, and, as a bonus, it's automatically updated with each new version of WordPress that comes out, so you're always getting the most up-to-date information. Another site for "absolute beginners," Awesome Motive is full of videos and articles covering many of the basics of setting up a WordPress site. It's one of the easiest-to-use WordPress training courses out there—so much so that, even if you're already too advanced for this site, you might want to keep it handy for any clients you work with who are WordPress novices. They'll be thankful you passed it along. For something a little more interactive, Treehouse offers a variety of courses you can take at both a beginner and intermediate level, including exercises and quizzes to help reinforce what you've learned. New users to WordPress will appreciate the slow, gentle pace that Bob Dunn takes with his training modules. He has videos for everything, from switching themes to boosting your SEO, all with a friendlier and more casual tone than many other WordPress training guides. What better place to start than the official WordPress learning archives? Here, you'll go over all the basics of customizing your WordPress theme and creating new blog posts. The site also includes a glossary of commonly-used WordPress terms. One last beginner resource, before we dive into the meatier WordPress training courses. WP101 is one of the most basic of basic resources; this is where you go if you're still a little fuzzy on what WordPress actually is. You'll learn the basics, plus a variety of tips and tricks that even the pros use to get their sites running. Now, we get a little more advanced. Carrie Dils is a freelance WordPress consultant and developer, focusing on theme development. Want WordPress tips on the go? In addition to blogs and courses, Carrie also offers a regular podcast where she talks about all the topics she discusses on her website. Are you on a bit of a time crunch? Despite the name, WPMU's services aren't particularly geared toward newer WordPress users. Rather, the courses here cover topics such as marketing and SEO that you might be ready to dive into, after you've already gone over the basics. iThemes has an extensive library of over 500 hours of recorded training sessions, but that's not the big hook here—they also offer live Webinars every month, where WordPress experts will cover the latest issues addressing WordPress users and answer your questions on the air. Yes, seriously—a half-year subscription to BlogAid is only one dollar! That price point gets you not just WordPress training tutorials, but also videos to help you enhance your website's SEO. If you don't know what "the Loop" is, then you should probably read this tutorial as soon as you can. All it will cost you is a couple hours of your time. This training module will help you safeguard your company's WordPress website against the threat of cyber attacks. It's a long read, but it's worth it if you want to keep your site (and, of course, your customers' data) safe. For a straightforward, A-to-Z guide to all things WordPress, it's hard to go wrong with The Tao of WordPress. This eBook provides a complete and comprehensive guide from starting up your website, to adding the finishing touches and supporting it over the long-term. For an extra eight dollars, you get free lifetime updates to keep you up to date on all things WordPress. If you've gone through the above resources, you probably already know what "themes" are—this website shows you where to find them. Hundreds of hand-selected themes are up for sale on this website, and you can also get personalized assistance in implementing them and tailoring them to your businesses' needs. Similarly, when you're ready to start customizing your WordPress page with plugins, Pippin Williamson has an extensive collection of both free and paid plugins to enhance your website's usability and tailor it to your exact needs. There are also advanced courses you can take on this site, when you're ready to start developing your own plugins. So far everything we've talked about has been online tutorials, articles, and demonstrations—Automattic takes a different approach. These are a series of talks held live at WordCamp events (which are conferences all about WordPress) about some of the finer nuances you'll need to understand in order to take your WordPress site to the next level. Want to learn how to use WordPress as a storytelling tool, or see where the future of WordPress is taking us? This is your go-to. This is your WordPress variety pack. It isn't a series of courses by one person about the topics that interest them the most; all of the courses on this site are posted by individual users. The quality-control here is a little iffy, but if you dig around you might find the very specific solution to your very specific problem. If you find your eyes glazing over when you're trying to read or watch WordPress training materials, then one-on-one support might be more your style. WPTutoring offers tailored learning sessions for both individual and business users, to help them get started with their WordPress sites and plan out a long-term strategy. Unless you're an HTML expert, chances are you'll be spending a lot of time in WordPress's visual editor. This video guide will teach you everything you need to know in order to make the site you want to make. A Complete Guide (free) Save time when building your WordPress site by using these helpful shortcodes to insert big chunks of pre-made content into your website seamlessly. By spending time with these services, you'll be well on your way to enhancing your business' online imprint and reaching more people than ever before.